A prolonged “nuclear winter” caused by an extra-terrestrial impact event some sixty-six million years ago, resulted in the extinction of most of the large terrestrial animals on Earth including the Dinosauria. So say a team of scientists from the Potsdam Institute for Climate Impact Research (PIK). 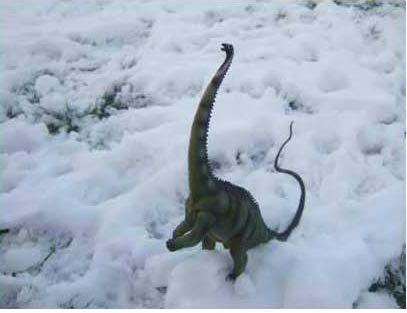 In essence, a period of sustained global cooling “froze out” the dinosaurs. Dramatic global cooling may have led to the dinosaur extinction event. Climate scientists have reconstructed how tiny droplets of sulphuric acid formed high up in the air after the well-known impact of a large body from space (Chicxulub crater event). These particles blocked sunlight for several years and had a profound influence on life on Earth. Plants died, and death spread through food chains. Previous theories focused on the shorter-lived dust ejected by the impact (the ejector). The new computer simulations show that the droplets resulted in long-lasting cooling, a likely contributor to the death of the terrestrial dinosaurs. An additional kill mechanism might have been a vigorous mixing of the oceans, caused by the surface cooling, severely disturbing marine ecosystems. To investigate the phenomenon, the scientists for the first time used a specific kind of computer simulation normally applied in different contexts, a climate model coupling atmosphere, ocean and sea ice. They built on research showing that sulphur-bearing gases that evaporated from the violent impact event on our planet’s surface were the main factor for blocking the sunlight and cooling down the planet. The scientists calculate that in the tropics, annual mean temperature fell from a balmy twenty-seven to just five degrees Celsius. To put this in a modern context, the average annual temperature at the heart of the Amazon rainforest is around twenty-seven degrees Celsius. Imagine the impact on the flora and fauna if this tropical part of the world suddenly had to endure a prolonged period of cold with an average annual temperature of just five degrees, that’s colder than the average annual temperatures experienced by the inhabitants of Oslo in Norway. Global temperatures prior to the extra-terrestrial impact event that contributed to the extinction of the dinosaurs. Global annual mean surface air temperature dropped by at least twenty-six degrees Celsius. The dinosaurs were used to living in a lush climate. After the impact event, the annual average temperature was below freezing point for about three years. Evidently, the ice caps expanded. Even in the tropics, annual mean temperatures went from twenty-seven degrees to a mere five degrees. Dramatic global cooling after impact event. 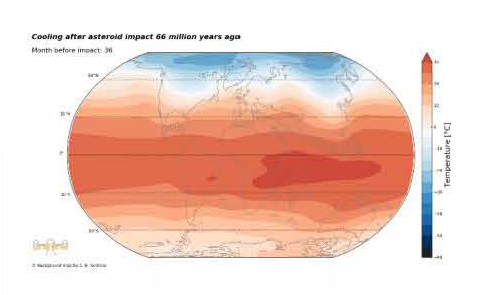 The image above shows the effect on our planet’s temperature just two months after the impact event. The researchers calculate that it took the climate about thirty years to recover, more than enough time to see the demise of seventy percent of all terrestrial animals as well as many different kinds of plants and a number of different families of marine organisms. As well as climate chaos, ocean circulation became disturbed. Surface waters cooled down, thereby becoming denser and hence heavier. While these cooler water masses sank into the depths, warmer water from deeper ocean layers rose to the surface, carrying nutrients that likely led to massive blooms of algae, the scientists postulate. It is conceivable that these algal blooms produced toxic substances, further affecting life at the coasts. Yet in any case, marine ecosystems were severely shaken up, and this likely contributed to the extinction of species in the oceans, like the ammonites and several types of marine reptile. The dinosaurs, until then the masters of the Earth, made space for the rise of the mammals, and eventually humankind. The study of Earth’s past also shows that efforts to study future threats by objects from outer space have more than just academic interest. 26 months after the impact, the world has rapidly cooled. Everything Dinosaur recognises the help of the Potsdam Institute for Climate Impact Research in the compilation of this article. The scientific paper: Brugger, J., Feulner, G., Petri, S. (2017): “Baby, it’s cold outside: Climate model simulations of the effects of the asteroid impact at the end of the Cretaceous.” This paper is published in Geophysical Research Letters.